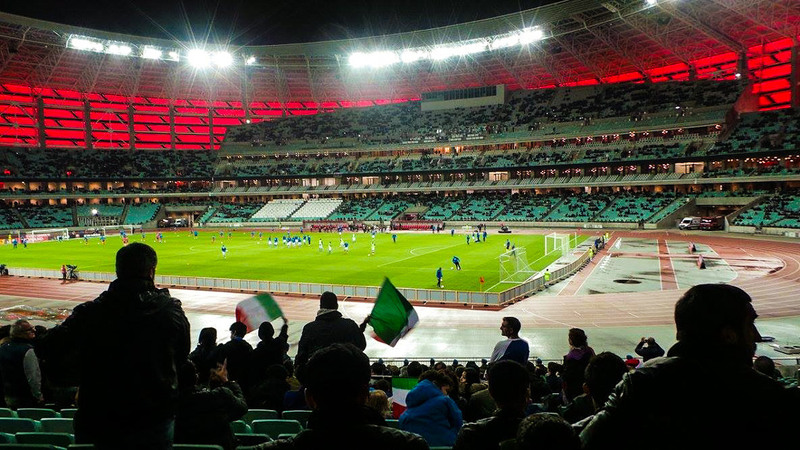 Baku Olimpiya Stadionu (Baku Olympic Stadium), also known as Baku National Stadium, was built to provide Azerbaijan with a world class venue suitable for hosting football and athletics events. 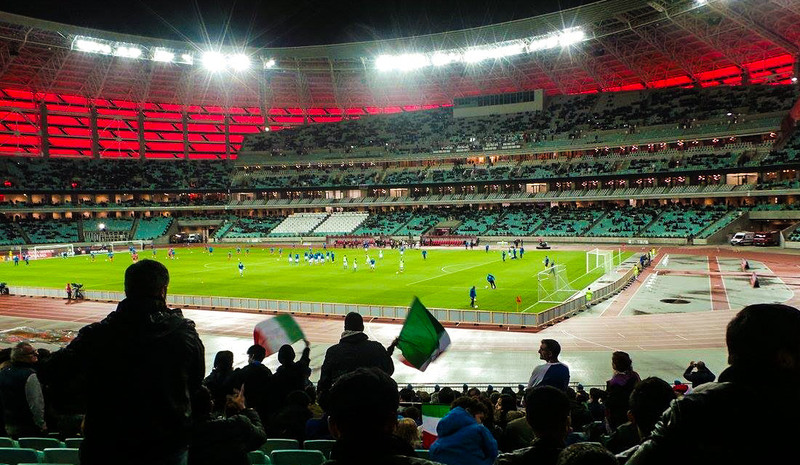 The stadium was specifically built to become the centrepiece of the 2015 European Games and become the home of the Azerbaijan national football team. Previously, Azerbaijan played their games at Tofig Bakhramov Stadium. Plans for the new stadium were first presented in 2008. Construction works started in 2011 and it took almost four years to complete the stadium. Baku Olympic Stadium officially opened on 18 March 2015 with an opening ceremony. The stadium came at a cost of US$ 600 million. 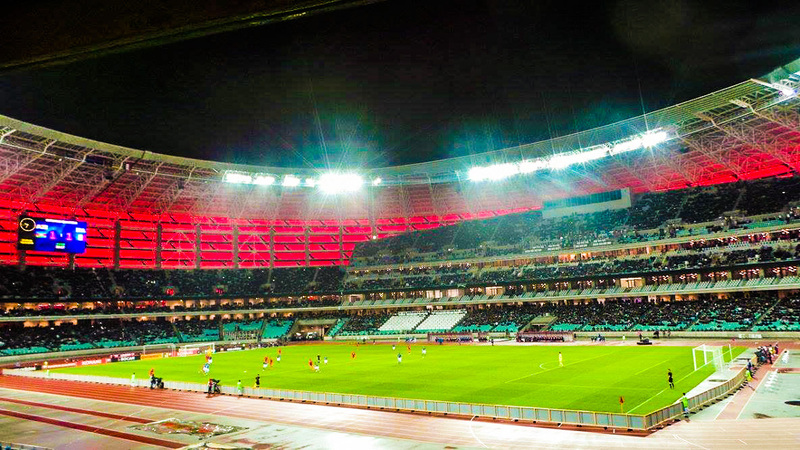 In the summer of 2015, the stadium hosted the first edition of the European Games. Baku Olympic Stadium has been selected as one of the playing venues of the Euro 2020 Championships, which is played across Europe. During the tournament, the stadium will host three first round group matches and one round of 16 match. Baku Olympic Stadium is located towards the north-east of Baku on the road that runs from the city centre to the international airport. It lies on the shore of Lake Boyukshor at roughly 11 kilometres from the old walled city and Fountains Square. The stadium is easily reached by metro. Koroglu station is a short walk away from the stadium. It’s on both metro lines 1 and 2. Line 1 can be boarded near the old city and Baku Boulevard. Baku Olympic Stadium lies on the shore of Lake Boyukshor hemmed in by motorways and railway tracks with residential neighbourhoods and some industry in the surroundings. There’ll be a few local restaurants around, but eating and drinking is best done in central Baku. If you are looking to stay close to the stadium, then Hotel Emerald is your best option. Otherwise there are few options within 30 minutes walking of the stadium. It is easy to get to the stadium from central Baku though, so most will opt to stay nearer to the city centre. Click here to explore the hotels in Baku. Baku Olympic Stadium offer guided tours around the stadium that last about 60 minutes. Call +994 12 422 64 10 or email tour@bos.az for the current schedule and bookings. Bos.az – Official website of Baku Olympic Stadium.